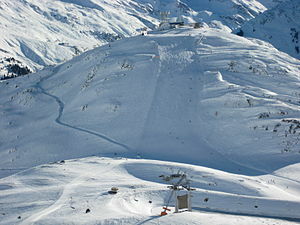 The Arlberg is one of the most famous skiing resorts in Austria and in the Alps. This it the place where Alpine Skiing was developed – hence their claim “Arlberg – the cradle of alpine skiing”. The Arlberg is a mountain pass between Tyrol and Vorarlberg (which name means “before the Arlberg”) and the Arlberg ski-resort is divided into two parts: Zürs-Lech and St. Anton. We did our skiing in the St. Anton part of the resort, which lays mainly on the Tyrollean side of the Arlberg. Overall the resort consists of 86 lifts, 276 km of pistes and 180km of powder runs. We were there for the powder runs, as it snowed on Easter Sunday and we thought there still might be some powder around. Unfortunately the sun is already to strong in April and we struggled to find some real “champagne powder”, but were still able to do some great off-piste runs. But the relative wetness of the snow made it to power skiing and after about 3 hours we had to stop and decided to enjoy the beautiful spring sun in the “Hospiz-Alm” at St. Christoph am Arlberg (a small part of St. Anton am Arlberg on top of the Arlberg pass). You can find a beautiful picture of St. Christoph seen from above in this post from Adam from Catch the Jiffy! If you want to see what skiing looks like at the Arlberg have a look at this great video of “powder-skiing” at the Arlberg over at http://www.skivideo.at! St. Anton is great for international ski tourists, as they have guests from all over the world and therefore English is spoken very well in this area (although you will never have problems to find someone speaking good english in Austria). The prizes are rather high, but this is to be expected in one of the greatest skiing resorts of the world. I am already looking forward to the 2012/13 skiing season, but meanwhile its time to enjoy spring!